Just as we’re gearing up for our 2017-18 book project, we begin the process of choosing the next book, for 2018-19, starting with nominations. The theme for 2018-19 is “community building.” Complete information is here. The 2017-18 edition of the Campus Community Book Project — its 16th — will spotlight Redefining Realness: My Path to Womanhood, Identity, Love & So Much More. 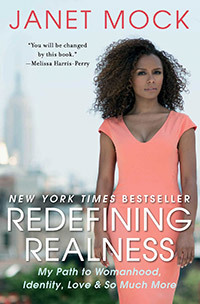 Janet Mock’s 2014 book relays her personal experiences growing up multiracial and transgender, offering her perspective on the challenges she faced and how she achieved acceptance and self-realization. It was published by Atria Books, an imprint of Simon & Schuster. Along the way, Mock earned a master’s degree in journalism from New York University, worked as an editor at People.com and produced HBO’s The Trans List. Everyone in the community is encouraged to read her book and discuss it, and take part in related programs — lectures, workshops and the like — in the fall quarter and extending into winter quarter. The 2017-18 book project will culminate with Mock’s campus visit on Monday, Feb. 5, when she will participate in a free Forum@MC from 4 to 5 p.m. at the Mondavi Center for the Performing Arts, and give a talk at 8 that night in a ticketed event at the Mondavi Center. The selection committee began reviewing nominations in July 2016, looking for books that were compelling, thought-provoking, well-written, accessible and inviting to a diverse population, among other criteria. The book project dates back to 2002 — established in the aftermath of the Sept. 11 terrorist attacks as a means of promoting dialogue and building community among people of diverse backgrounds. See all of the books, 2002-03 to 2017-18. Another committee is tasked with programming the lectures, workshops, panels and other events that will accompany the featured book. This year’s planning committee is now being formed — and all members of the campus and greater community are invited to participate; contact the book project planning coordinator, Megan Macklin, by email. In addition, instructors are encouraged to integrate the featured book into undergraduate coursework, including First-Year Seminars, the University Writing Program and Workload English. The Campus Community Book Project is sponsored by the Office of Campus Community Relations, the Campus Council on Community and Diversity, and the offices of the chancellor and provost. For their part, selection committee members said Mock was the clear winner based on this year’s theme. And though her story may be foreign to some readers, the general message of self-discovery and acceptance will be familiar. Jeff Magnin, a continuing lecturer in the University Writing Program, added that Mock’s well-written prose and insight made her a standout among the other nominated books. He is not alone in his praise for Mock. Since the book came out in 2014, it has been a New York Times bestseller and a finalist for the annual Lambda Literary Awards, which celebrate LGBTQ books. Her book is acclaimed for offering an unflinching glimpse into her journey, though she makes no claims to speak for anyone else. Her second book, Surpassing Certainty: What My Twenties Taught Me, debuted today (June 13). Jocelyn Anderson is the editor of UC Davis Magazine. She can be reached at jocanderson@ucdavis.edu.